Singer-songwriter Bobbie Morrone will drop a new album February 4. Entitled Lonely St., the album features the talents of Morrone (vocals, guitar), Isaac Vining (drums, percussion), and Adam Skinner (bass). Based in Indianapolis, Indiana, Morrone set off on his musical journey in 2007. His sound blends blues, soul, and pop into tasty music of distinctive flavors. Prior to the imminent album, Morrone dropped an EP, Acoustics ’15, comprising five tracks. 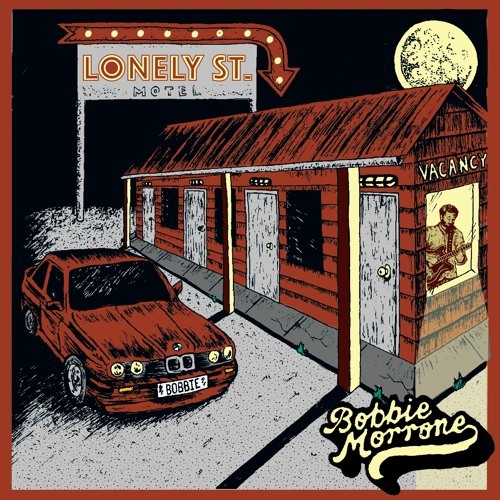 Lonely St. encompasses 12-tracks, and was produced by Morrone and Jon Class. Opening with a bluesy track called “Behind The Walls,” Morrone immediately establishes his bona fides with a tune reminiscent of John Mayer, innovative, bouncy, and easy to listen to, with smooth cool horns and creamy vocal harmonies. Along with “Behind The Walls,” the best tracks on the album include “Get By,” a swampy, blues-flavored rock number with an infectious resonant energy and a gospel-lite feel to the vocals and harmonies. “One Of A Kind” rides a pulsing R&B melody tight with oozing colors and beau coup supercharged guitar riffs, as well as a braying organ that infuses the tune with drawling depth. I love the guitar solo on this song, skintight, controlled, yet searing. “I Can’t Fall That Far Intro” features a tick-tocking bass line and creamy, strident guitars. This might be my favorite track on the album because of its sensuous flow. “I’ve Got It” opens on a crunching groove and dirty guitars flowing into an upbeat blues-flavored alt-rock melody that goes all-expansive on the chorus, inserting a bright wall of sound. “Jam” delivers dark dirty guitars atop a Mississippi blues melody with a funky flow, wailing guitars, and a strident organ. The last track on the album is the title track, a downtempo acoustic number with pop sensibilities. Morrone’s voice takes on a tender savor that’s evocative and gentle. Lonely St. is splendid, full of blues, pop, and rock energy concocted with charm and imaginative originality. Bobbie Morrone certainly knows what he’s doing.